The BD Insulin Syringe with Permanently Attached Needle is designed for comfortable injections and successful insulin delivery. The BD Permanently Attached Needle Insulin Syringes are constructed with a clear barrel and easy-to-read scale with numbers and wide unit spacing that allows the user to draw the accurate dose within the barrel. This syringe features a large flange that is designed to allow users to firmly hold the syringe in place with drawing insulin. 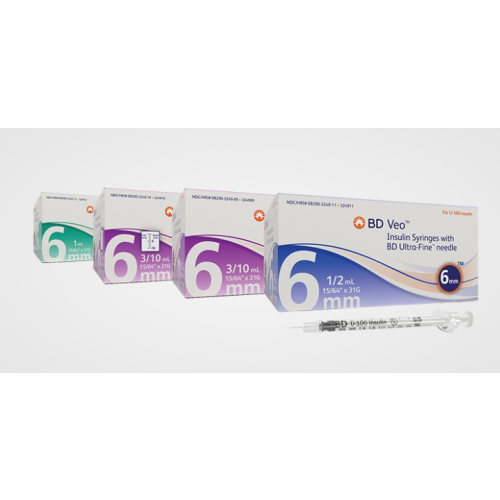 The BD Low-Dose Insulin Syringes are available in two mL sizes: 3/10 or 1/2 mL, the standard insulin syringe holds 1 mL of insulin, both designs feature an ultra-fine needle, which helps reduce anxiousness by being less likely to cause painful injections into the muscles. There are a wide variety of insulin syringes available at Vitality Medical, on sale today.